Online Course Catalog - All Courses Closed as of May 31, 2015. Click here for all Course Descriptions and Registration or click on one of the courses listed below. 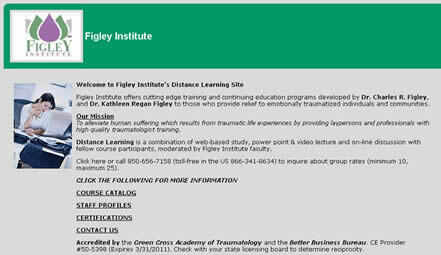 Figley Institute was a Continuing Education provider approved by the Florida Board of Clinical Social Work, Marriage and Family Therapy and Mental Health Counseling; CE Provider #50-5398 through 3/31/2015. Accredited by the Green Cross Academy of Traumatology through December 2014.